The choice between leaf spring axles versus torsion axles can involve several factors. First, I’ll start by saying each has its advantages and disadvantages and there are many people who think that their choice, whether leaf spring or torsion, is the only logical one. Here are some of the facts. Standard leaf spring axles use a series of metal springs while torsion axles use a rubber spring for suspension. Leaf spring axles are less compact than torsion axles and take up more space and add more weight to your trailer. Torsion axles cannot be repaired; they must be replaced while leaf spring axles can be repaired. The downside is that leaf spring axles need more maintenance than torsion axles do. The rubber inserts in a torsion axle will tend to lose memory and strength if a loaded trailer sits idle for an extended period of time. Torsion axles may not perform as well in extremely cold weather as their rubber will lose its elasticity. With leaf spring axles, the load on the axles is always balanced, this means that if your trailer rides over a rough patch of road and the axles become out of alignment, both axles will still carry the same amount of weight because of the built in weight equalizer. Torsion axles don’t have this feature as they have independent suspension. If there is more weight on one tire this can lead to heat build-up and cause blowouts. Torsion axles tend to be lower to the ground while leaf spring axles will have more clearance. A torsion axle, with its lower center of gravity will offer improved handling and better cornering. Torsion axles will have a better ride than leaf spring axles as torsion axles are cushioned with rubber. Torsion axles are preferred for lighter loads and on-highway use. However, due to the fact torsion axles do not offer weight equalization, they are not suitable for heavier loads, rough roads or off-highway use. In the end, torsion axles will give you a better ride and require less maintenance than leaf spring axles will. Leaf spring axles are more durable, less expensive and easier to repair. Each has their fans and both work well. You might also be interested in Single Axle Trailers vs Tandem Axle Trailers. If you are looking for a great trailer at a low price, click on the type of trailer you are looking for at the bottom of the page. 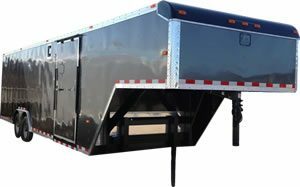 Visit our Enclosed Trailer Shop to see our top quality trailers.